Trying to get that summer body? Here’s a healthy recipe that’ll make losing weight a breeze! 1. Mince garlic and put in bowl with ¼ tsp of salt. Toss to combine. 2. Set a fine mesh strainer over a heat-proof bowl. Heat ¼ cup of oil in a small saucepan over medium heat. Add garlic and stir. The garlic should maintain a very gentle bubble. Reduce heat if it bubbles too much. Cook until the garlic turns into a pale golden brown. Strain, then transfer the garlic to a paper towel-lined plate. Set the oil and the garlic aside, separately. 3. 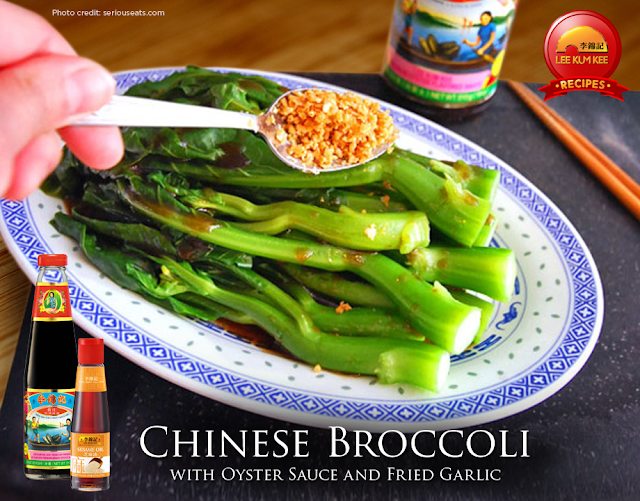 In a small bowl, combine 1 tsp of the reserved garlic oil, sesame oil and Lee Kum Kee Premium Brand Oyster Sauce. Mix well until combined then add a tbsp of hot water. Stir and set aside. 4. Bring a large pot of water to boil. Add the Chinese broccoli and boil until just tender, about 4-5 minutes. Drain well and dry with paper towels then place on a serving platter. Drizzle with the mixed sauce and sprinkle with fried garlic. Serve immediately.